A discussion-based ESL classroom. Is it applicable? "A series of hierarchical linear models indicated that discussion-based approaches were significantly related to spring performance..." (Langer, 2009). As stated by Langer, discussions are mostly related to good and arising performance in language. This indicates group discussions can be implemented in a class of students who can converse well in the target language. I used to teach university students for six months and witness that students in that level of education participated well in the ESL classroom discussion. A lot of ideas were exchanged among one another since most of my the students are able to speak well in English. On the other hand, students in lower proficiency level are not advised to be taught using classroom discussions in ESL class. This is because they find it hard to say out what they think in the target language. As a result, the discussions become a more of a first-language discussion classroom. For example, I was given a poor English proficiency class this year in SMK Chung Hua. Whenever I bring out a topic to be discussed in the class, the students were absolutely interested to talk about the topic - in their mother tongue! This has hindered my aim of improving their English proficiency. For good classes, as mentioned earlier, I agree with the usage of classroom discussion as a method ranging from debates to group forum. However, for poor classes, I normally try to improve their vocabularies in order for them to give out their ideas - using games! For example, in teaching lexical chunks like 'In my opinion.....' or 'Frankly speaking.....' in giving their opinions. This will subsequently boost their confidence in English communication skill. Yesterday marked another history in Malaysia. Our 13th GE had just been successfully held throughout the nation. The winning party, BN, although losing 2/3 majority for the second time, deserves their victory. A lot of debates and speculations made post-election. But, frankly speaking, every party should accept their own fates whether or not they have won or been defeated. But the issue that worries me the most is the tendency of us to play the race issue here. Without neglecting the Malays, I admit this land belongs to the Malays. However to what extent does one can say the land belongs to one race and not the others? Why is it that we are so worried of the other races? Yes, that is embedded in our culture. THE MALAYS. We are lazy, ignorant but highly spirited when it comes to making riots and etc. Look at what happened yesterday, a video showing a group of young voters making a mess in Ipoh Timur. Were those young peeps the so-called New GENERATION of educated peeps? On the other hand, in Miri as an example, a lot of BN posters written with "A VOTE FOR PAKATAN=A VOTE FOR PAS" were hung up everywhere along the streets here. As a result, the CHINESE here voted OFF the BN and yeah, that is the race we usually call RACIST and being scared off. Ladies and gentlemen, the Chinese people are merely like us. They'll do anything if they think their rights have been taken away. I am currently teaching in a Chinese school and I do not see any problem occuring. In fact, my colleagues were so happy when I speak Chinese with them. For the Malays, GROW UP! there's a huge world beyond what you are living in now. Change people's mindset about us. We are NOT lazy and NOT idiot. and show the love we never had. telling me Ill love you till ever. Because I dearly love you. You are the rain beneath the rainbow. It has been quite a remarkable year in 2012. Im sorry for not updating my blog all these while. Tonight, I have a special poem. Yes, it has been quite some time since the last time I write a poem. Know that these poems represent my heart and my words. Those I can never utter out loud. enjjoy! "How Do I Start Writing my Story?" And my heart is everywhere. They are all seem perfectly together. To prove how much you worth. Yes, not you never you. Love, what is that all about? My friends love me but never did they bring me low. Do you love me? I never know. Do you really love me? I do not know! Is not something I adore. How do I ever start writing my own story? Malay versus chinese. Three words that may encapsulate different views from different people. The Malays, as again and again, shall I say 'born in the silver spoon' in Malaysia with Ketuanan Melayu, Hak orang-orang Melayu and so on. And here it is still, Chinese, born in a rotten spoon, conquering the biggest industries in Malaysia - Farming, business, tourism and etcetra. Well, Dr. M said "Org Melayu, buanglah tongkat sendiri dan belajarlah berjalan dengan kaki sendiri"
WoW! Now, I know why Dr. Salina in my 'Current issues in Education' class adores Dr. M so much. He is a man with a mind of an alien. I mean, he does not think like us. I do agree with him in this sense. THE MALAYS have to be slapped on their face and wake up!!! It is not that Chinese have good genes and Malays are not. We are all born with the same capacity of the brain in our cranium (except the brainless mat rempit i guess). But the thing is, its about the extent that we use our brain to build up the life that we want. 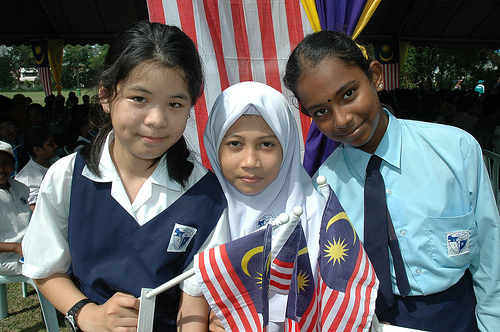 The Chinese, if we think again, why do they succeed in Malaysia...a land of the MALAYS? The answer is simple, because they are minority and they do not have the government to pamper them so much with this and that and this and that. For instance, Ive read a newspaper clip long time ago when this Chinese kid said that her mother always pushes her to study hard because 'we are always the minority no matter what'. If two Malays with 10As can go to university only one Chinese is offered to do that. That is merely a fact! It is normal for human to feel insecure if they are a bunch of minorities. Look at the Malays in U.K for example, how do they survive there? I heard most of them opened businesses to support their life. So, why cant we in Malaysia become the Malays in the UK? Because, we are just too pampered by our own government. I'm sick of telling this because deep in my heart (although I'm chinese+malay) I know that Malays are also capable to succeed. Yes, some Malays have proven that....Look at Al-bukhari....Sosilawati even....They are a bunch of successful Malays. But its only them....what about the other 99% of the malays?????? Reading is my part-time job..hahaha...since i am, yes, i think i am, a language person. I love to sing, and involve with any helping activities(ya, right!) Some people may think I am too good to be true, too bad to be here, too clumsy to give opinions...but, whatever it is, I am still NOOR AINULFAHIM!! !